Every year, the Fayette County Board of DD celebrates the month of March as National Disability Awareness Month, along with the other 87 county boards around the state of Ohio. 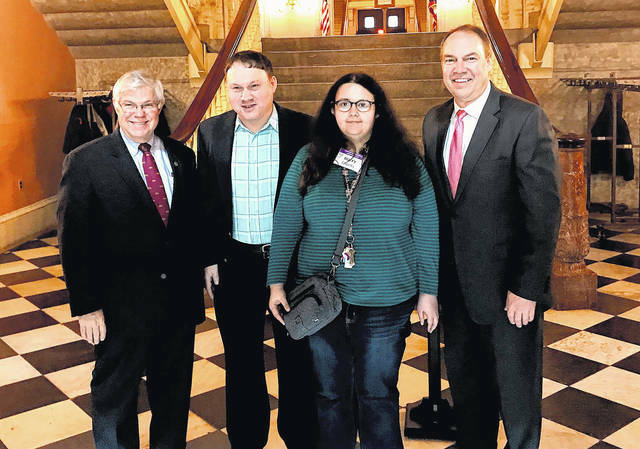 Every year individuals the board serves, family members, and stakeholders rally together at the Ohio State House to make positive changes in the lives of people with disabilities. Two advocates from the F.A.C.T. (Fayette Advocating Change Together) group attended the 2018 Developmental Disabilities Awareness and Advocacy Day. This year, the theme was “Celebrate CommUNITY.” CommUNITY means people with and without disabilities working, going to school, playing and participating in our communities as friends, neighbors and co-workers. – Shari Cooper, motivational speaker and writer for the Dayton Daily News. – Christine Brown, one of the most recognized advocates around Capitol Square. Christine works as a clinical research assistant at the Nisonger Center. – Wallace Peck, an artist who works on his incredible skills at the Open Door Art Studio and Gallery. – Logan Detweiler, an advocate. – Josh Anderson, motivational speaker, advocate, Direct Service professional. – John Martin, director of the Ohio Department of Developmental Disabilities. At the conclusion of the event, each county had the opportunity to present concerns to their legislators. The F.A.C.T. self-advocates representing Fayette County were Buffy Enochs and Chuck Stackhouse. Buffy and Chuck shared their concerns with State Sen. Bob Peterson and State Rep. Gary Scherer. Buffy spoke about the Direct Service Workforce Crises and shared how this has affected her personally. The F.A.C.T. group (Fayette Advocating Change Together) is just one of the many programs and services provided by Fayette County Board of DD. This group meets on the first business day of every month at Kroger, in the upstairs conference room. FACT provides members with opportunities to build confidence, discuss topics relevant to their lives and to advocate for themselves in order to carry out their hopes, plans and dreams. To see the full DD Awareness event along with services provided by FCBDD, call 740-335-7453, go to www.fayettedd.com or wwwfacebook.com/fayettecountydd.